Hello Friends! Super short post this evening. I have a DT deadline and a few more cards to crank out before Friday, but...I did want to get in a little relaxing color time! I put on a Michael Buble' CD, brewed a pot of Earl Grey de la Creme Steeped Tea-soooo yummy...and colored this little guy. He's part of the freebie digital stamp set that I was given for participating in the From the Heart Stamps monthly challenge. I printed him onto smooth white card stock and colored him with my Polychromos pencils. He's a work in progress and I will finish him up tomorrow and put him on a card. I know there are many of you who live in snowy climes and probably cringe at the sight of snow people images but, I live in sunny Southern California and although my little town does get snow, it's very rare and it's not a lot. 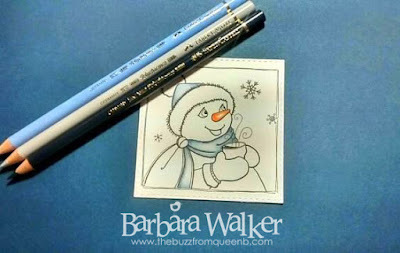 I really like snow folk and Faith, the illustrator at From the Heart Stamps draws some super cute ones. She has this series of snow people called Project 100 Snowmen, the images are adorable and they only cost $1.00! No joke. And they are loaded with word art! In fact, the image I am featuring here, Snowman and Cocoa has 6 sentiments in the set and it's only ONE DOLLAR. Check it out! That's it for me. Thanks for dropping in. I'm relaxed and feeling all warm and cozy after drinking my tea. I'm going to bed now. Good night. So cute!! Gotta head over to that site and grab a goody! We got 13 inches of snow the other day and I still think snowmen are adorable! :) Hugs! Greetings from the land of snow and ice! (and we like it that way--at least for 4 months of the year). Your soft pencil-colouring is lovely, and I salute your dedication to the daily colouring challenge. I like the sounds of your tea, too! Off to brew something warm; I hope to do some colouring this weekend.